With the centenary of WW1 upon us, I’m reminded of a trip I made a couple of years ago. We took a few days off and drove from France into Belgium. Shortly after we left the motorway system and began to drive through the lovely Flanders countryside we saw a small cemetery. Surrounded by a brick wall, it housed neat rows of white markers, maybe a couple of hundred or so. A few miles further and there was another, and then another and another until it seemed as if just around every corner another field of white was waiting. Thousands of white stones: Thousands of heroes. In the evening we attended the ceremony at the Mennen gate. Another white marker, this one huge, with more than 54,000 names etched on its surface – those lost and for whom there is no grave. The lady in the hotel said “get there early, so that you can get a good spot to see” Why” I thought, “on a weekday evening in early spring, how many does she think will be there?” but we did as we were told and arrived a good half an hour before the ceremony was due to begin. Some people were already there when we arrived, and as we waited with the light fading and an evening chill descending, the numbers grew until we were 3 and 4 deep around the gate. A good 200 people witnessed the simple ceremony, the usual number, we were told, which could swell to several hundred more on special days. People from all corners of the earth were among the assembled crowds; an Australian standing next to a Brit, who was next to a Canadian, next to an Indian; just as the grave markers had been with no order of nationality or regiment, just how they fell. People of all ages, many of them so young that even their grandparents hadn’t been born when this conflict raged: An old soldier standing as smartly to attention as his age allowed; a much younger man who, quite unashamedly, removed his glasses to wipe away the tears. 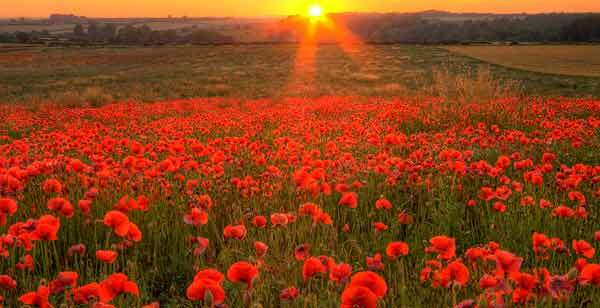 My church in Higham Lane, Tonbridge is planning to hold a ceremony in November to remember especially all those who died during WW1. To begin the commemoration the scouts have dug a trench at the front of the church which has been planted with poppies. We have also refurbished the WW1 memorial plaque that used to hang in the old East Street church with names of Methodists and Wesleyans who fell in battle. 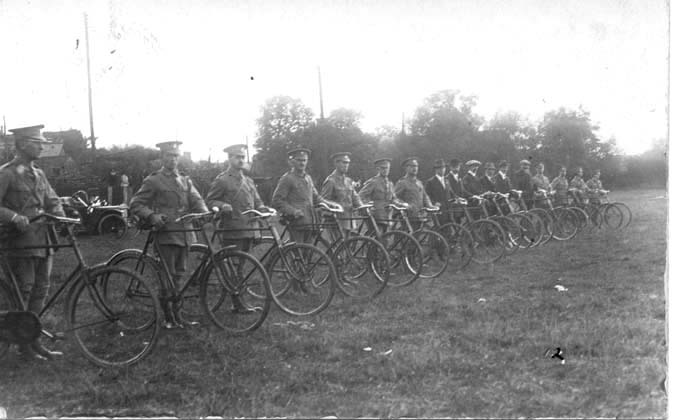 I was intrigued by a reference to a Kent cycle corps and then, quite by accident, found this photograph. Can you imagine going to war on a bike? What was their purpose? Were they the forerunners of the motorcycle despatch riders of WW2? I wonder how many of these men of Kent and Kentish men returned to their families. You may already have seen this but if not this link might answer some of your questions.